Hey guys so maybe you guys don't know this but I am currently in LOVE with gel manicures! I've never had a professionally done gel manicure but I've done them myself and not only do they last longer but they look awesome too! Regular manicures last a few days but gel nails last 2 to 3 weeks! Which is amazing since I don't always have time to do my nails. Anyways I've collected quite a bit of gel and nail art supplies so I thought why not show you guys my collection? I got this 24 pack of UV glitters on eBay for around $5. Pack of lint-free wipes (a essential for gel nails), Freeman peppermint and plum foot lotion, Gelish artificial nail remover, a small glass, and Gelish Structure Gel. I displace all of my nail supplies in a birchbox. Great for organizing! Fimo clay rods I got a pack of 100 on eBay for about $5. Four nail art spheres with pearls, gems, and dessert fimo slices (also from eBay). Nail dotting tools, nail file, nail buffer, small nail essential kit (Comes in a cute cupcake pouch! ), and a four sided nail buffer. Heart shaped nail file (Which I got from my Birchbox), 3D acrylic nail art letter mold, blade (to cut the fimo pieces), 7 piece nail art brush set, cuticle pusher, nail file, big nail clipper, cuticle remover cream, and nail tweezers. I use the Sensationail starter kit by Nailene. I got this as a birthday gift and I love it! 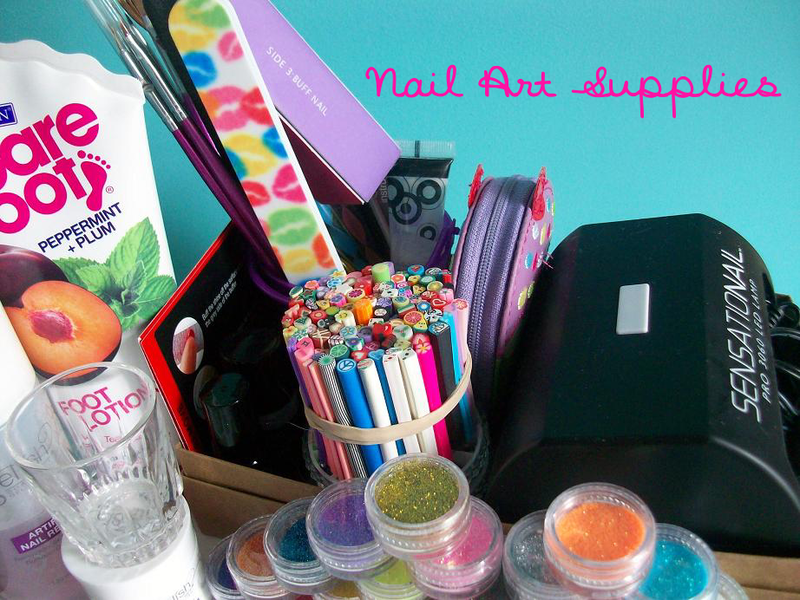 It comes with all the gel nail essentials you need to get started. The LED lamp and the bottles in the kit are a bit small but I was ok with that because you only use them once or twice a month. Here is a closer look at the bottles you get in the Sensationail starter kit. You get a gel nail color (I got the pink chiffon kit), a clear gel coat that you use as both the base and top coat (You use this a lot so I would recommend getting a separate base and top coat), a gel primer, and a gel cleanser. I'm still pretty new at gel manicures but once I get the hang of it I will make more gel nail rated posts. Do you guys like gel nails?